Last week I shared how we need to open our eyes to stories that are all around us. This week, I have invited my friend and teacher writer, Amy Pine, to talk about how we keep track of notes. I find it fascinating that writers find ideas all over the place and find equally as unique ways to jot down those ideas. Writer's notebooks don't have to be conventional paper and pen any more! JEN: Hi Amy! Thanks for joining me today! Can you tell us a little bit about yourself and how you have been participating in Teachers Write? AMY: Hi Jen! First of all, thank you so much for having me as a guest on your blog this week. I’m fangirling a bit that I get to do this! As for Teachers Write, I jumped in on that first Friday Feedback with Gae, and let me say, it was exciting and terrifying all at once. I’ve got three complete manuscripts right now (one YA and two NA), and I had the privilege of sharing some of my YA on Gae’s blog. That’s the exciting part. I received feedback from Gae and got to give feedback to her. THAT is the terrifying part. I crave feedback and couldn’t grow as a writer without it. At the same time, it never gets easy to put your writing out there. Additionally, I still haven’t gotten over the idea of, “Who am I to critique other writers, especially a wonderful published writer like Gae?” But I found on Friday Feedback the same thing I’ve been finding in the online writing community in general--helpful critique and wonderful support! Since then I’ve been drafting, trying to apply some of the Teachers Write warm-ups and exercises to my current manuscript, and now it’s time to edit and get this one ready to query! JEN: When we started talking about writing, you told me that you get great ideas in the shower....and then you write them down in the shower! Can you tell me about your shower notes? Here is the picture I tweeted and posted on Facebook the day I got my Aqua Notes in the mail. I actually wrote the hashtag while fully clothed after just installing the note pad in the shower and then took the pic after the shower to show that water had no effect. And of course, a friend on FB made the obvious comment about me writing while naked. Yep, that’s when the rest of the notes occur, but this first one I swear I was fully clothed! JEN: I definitely get ideas in the shower and sometimes in the car. I started using the Voice Memo app on my phone this week. I'm so glad I finally tried it! On the way home from work, I started thinking out loud and I found that it really helps me to let my thinking wander. I've been struggling and feeling like I need to connect with my characters more. I think I finally have more of a grasp on my character's now. Here is a little clip from one of my voice memo notes where I had a huge epiphany. I hate when I get ideas driving home that I forget to write down. It can be so frustrating! Not any more! Do you use technology to keep track of ideas? AMY: I haven’t used the voice memo yet, specifically because I cringe at the sound of my recorded voice, so my idea, however brilliant I may think it is, will make me cringe if I say it to myself! I do use the Notes feature on my phone, and I also send myself a lot of emails. In fact, I think I email myself more than any one person emails me. Is that bad? For instance, last night, after finishing my WIP, I rewarded myself with an episode (or two) of my guilty pleasure, Vampire Diaries. A random idea for a conversation I wanted two characters to have popped into my head. My laptop was right next to me, so I sent myself a quick email and dropped it into my ideas folder. When I go back and write that scene, I’ll check my notes from the email and then delete it when I’m done. I do this a lot. JEN: I’ve never thought of sending e-mails to myself! I’ve actually started using Evernote a lot lately and I’m loving it. I have a few ideas in the Notes app on my phone but I created an Evernote notebook for all my writing and then inside that notebook, I have a stack of notebooks for the different books I’m working on. I have notes for each of the characters in my current WIP and the same for two other books that I’m still just planning. Just today I created a notebook for the non-fiction narrative picture book idea I’m starting to research. I love that Evernote lets me include pictures and even audio there. I love how easy it is to record voice memos but I might actually try recording directly to Evernote because then the audio clips will be embedded into my notebooks. So many people have beautiful notebooks, and I have some, too, but I’m in love with how easy it is to use my phone or iPad to keep notes because one of them is usually with me. The other thing I love is that I can reorganize things later and it’s all nice and neat. In the end though, it’s really about doing whatever works for you. Try new ideas and see what works. I can’t imagine doing Teachers Write without some kind of way to take notes. Every author I have ever heard speak talks about how he or she keeps a writer’s notebooks for his or her ideas. 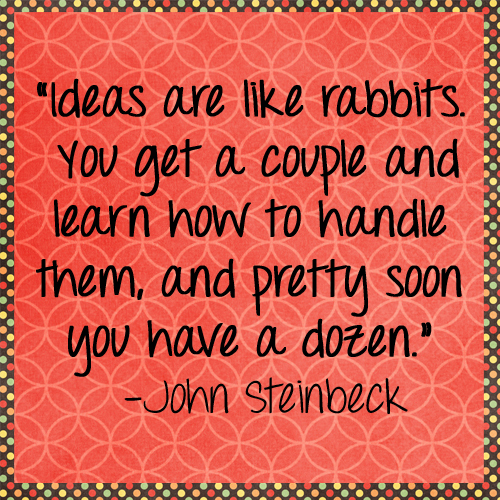 When I opened my eyes to ideas all around me that I could use in my writing, I found that I notice seed ideas all over the place. It seems only natural to jot down those ideas because there simply are so many and I know I would forget things that I would really want to come back to. As much as I trust myself to remember...I feel a lot better knowing I have those ideas tucked away somewhere when I’m ready. Thanks for sharing your note-taking ideas, Amy! 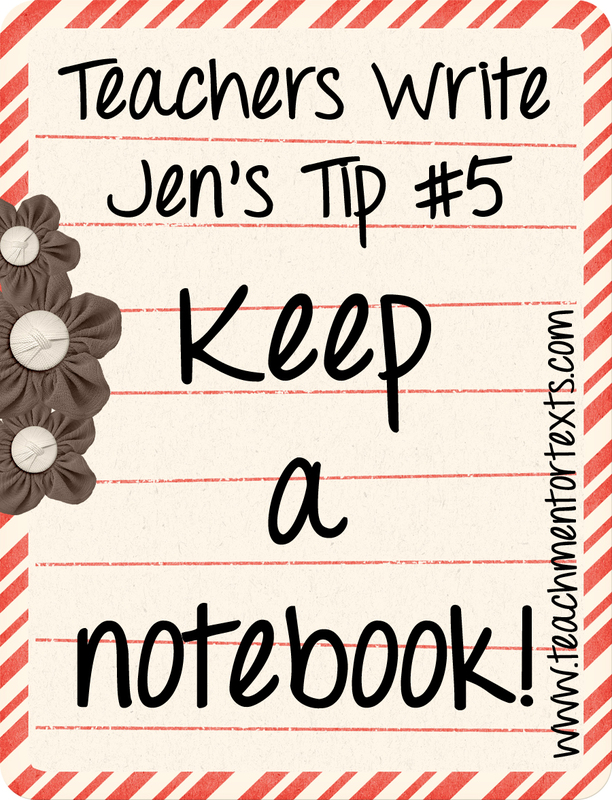 I appreciate you sharing your unconventional writer’s notebook ideas! I can’t wait to hear what other readers use for writer’s notebooks! AMY: Haha! I kind of like being called unconventional. 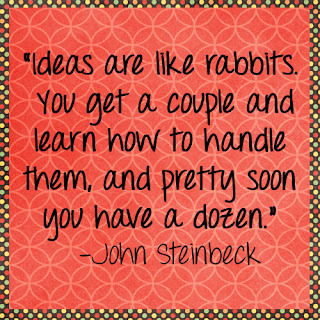 We all have our writing quirks, so thank goodness we are creative people who can find creative solutions to problems like, “I get my best ideas in the shower! How do I deal with that?” I’ve got to say, I was so happy to learn about Aqua Notes not just because it fulfilled my writing need, but it also comforts me to know that I’m not so freakish as to where and when my inspiration strikes. 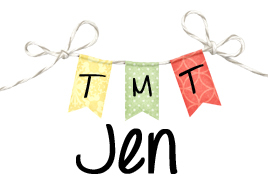 Thanks for inviting me to your blog, Jen! So honored to be here. Looking forward to hearing other note-taking ideas too. And thank you, Gae, Jo, and Kate for taking the time, energy, and passion to organize another fabulous Teachers Write! JEN: I get so much energy and motivation from Teachers Write. I love connecting with people like you, Amy! It’s awesome to know that we all do work with students and that we all want to be writers ourselves to better support students. It’s awesome. Thank you again! Well, the pit of my week was that I didn't get my 30 minutes of writing in every day. Being back at work and working long hours because the office is closed on Fridays made for really long days. I did write on Friday, Saturday, and this morning before my family woke up. Three out of seven isn't tooooo bad. I started my Voice Memos on the way home from work and that really helped me work through ideas for my writing. I also found a couple of character exercises that prompted some ideas, too. One was to think about five gifts my character got for her last birthday. And of those five gifts, which one did she love the most. This really helped me think about my main character and what would mean a lot to her. I shared at Gae's Friday Feedback and that always makes me feel good. It's the peak of my week as usual. Another peak was talking with Amy about writing. I love to hear how everyone is doing and to be able to cheer you on. I'm so proud of everyone! And if you feel off track, no worries! Just do what you can. One day at a time! Where do you keep your notes? 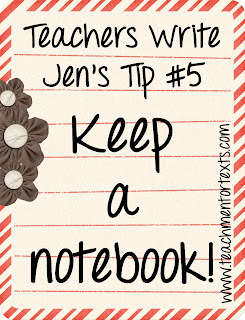 Do you use a physical notebook or some other type of notetaking method?